The crows were not happy about this first year parking on their tree. First grade students’ view of the eagles in Croton. 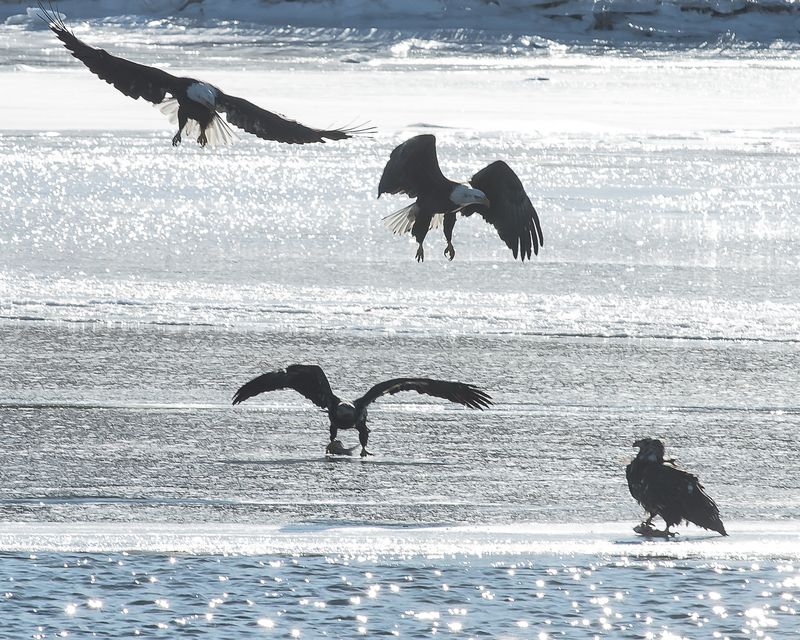 There have been at least 15 eagles hunting at the Croton Boat Ramp the last two days. The Croton River started moving again. Verplanck marinas sported another 15-20 fishing and perching relatively close. 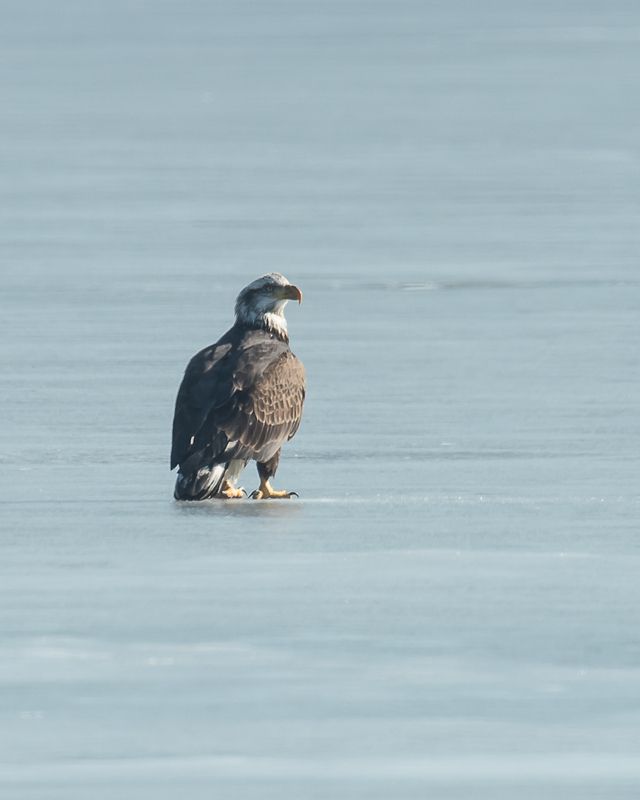 Thursday night’s eagle count from the dock in Verplanck came in at 15. 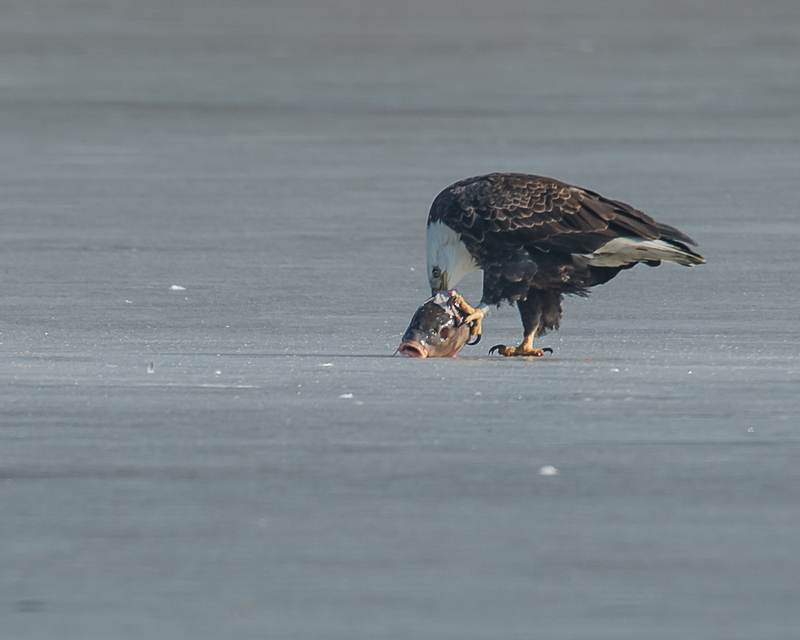 Just at dusk an immature caught a fish and brought it to the ice south of Stony Point. 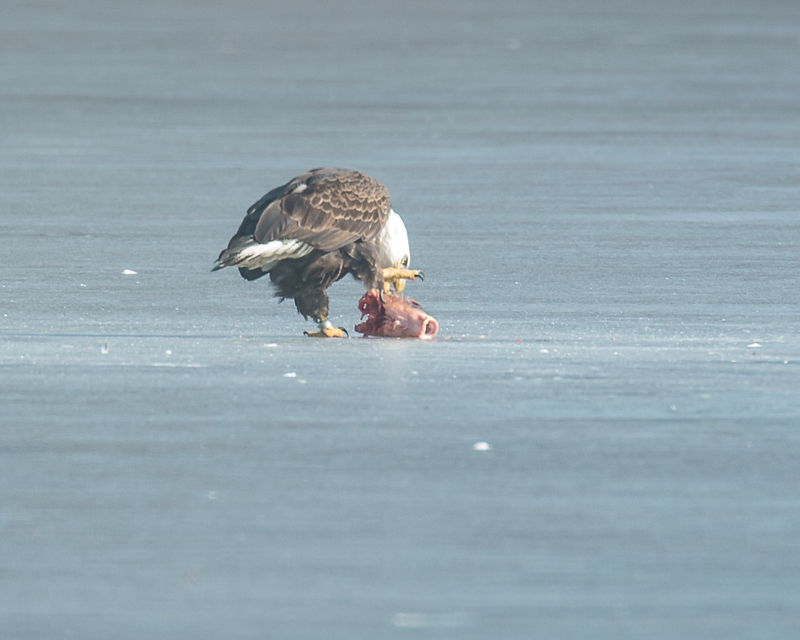 11 eagles hoped for a few bites. 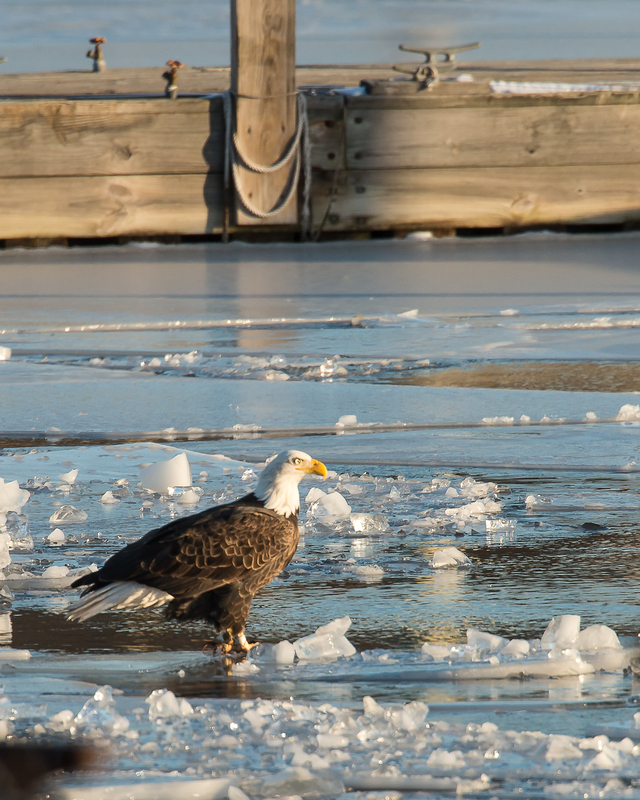 Eagle with bands enjoying fishing in the Viking Marina in Verplanck. 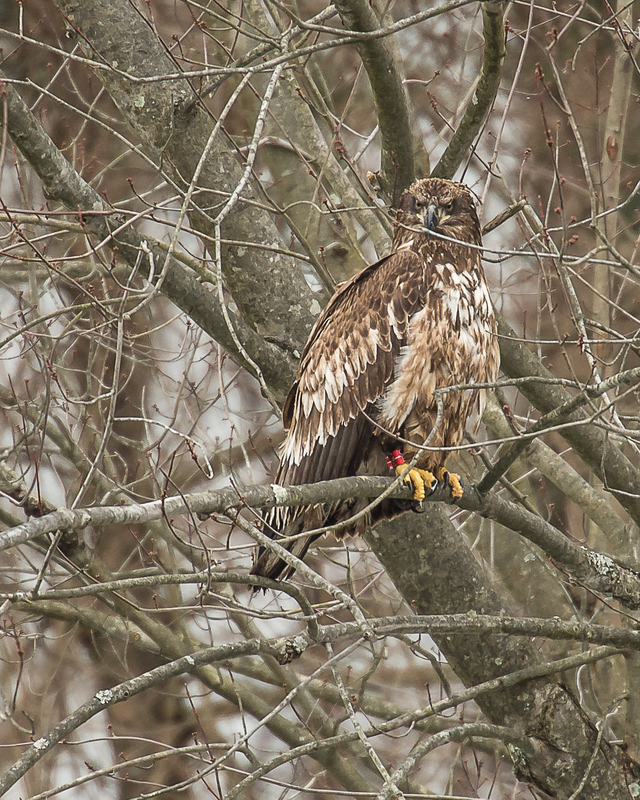 Young eagle waiting for lunch on the Croton River. 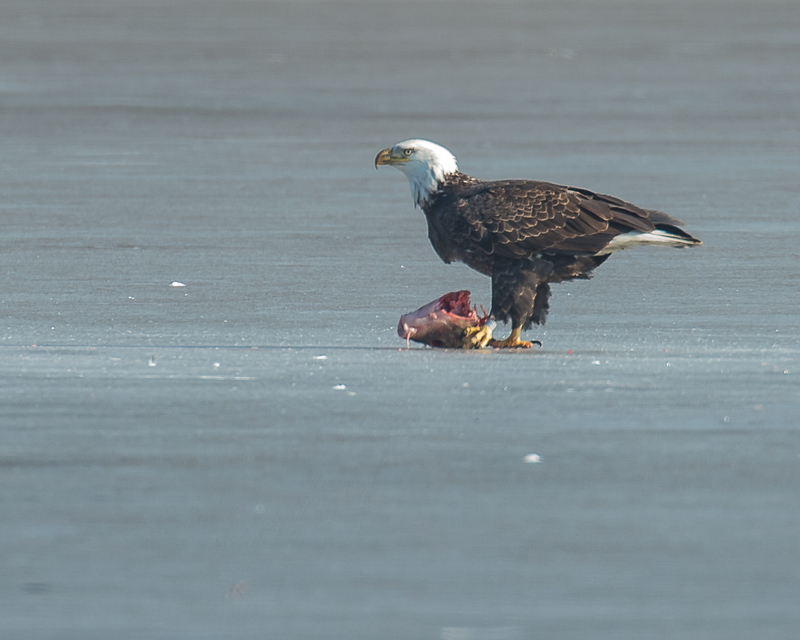 Second eagle waiting for lunch downstream from the first one on the Croton River. 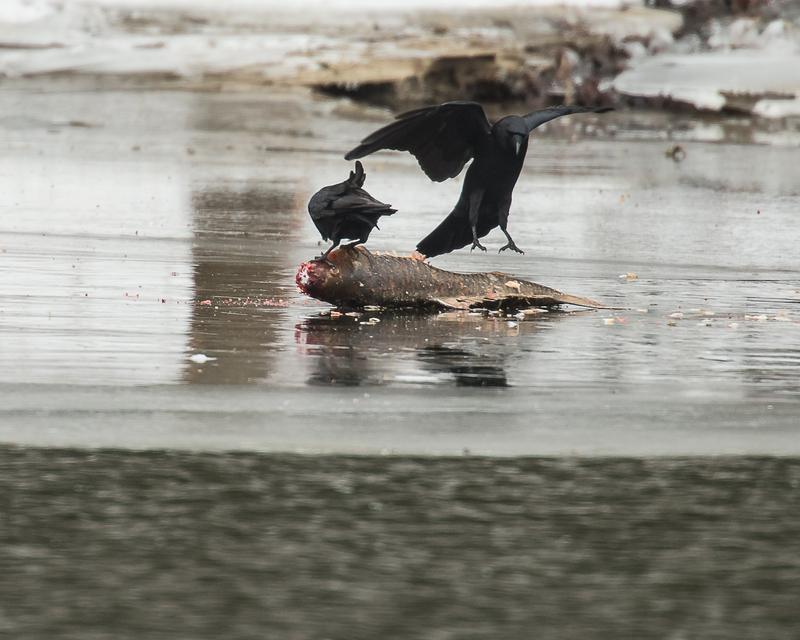 Eagle lunch for the crows. 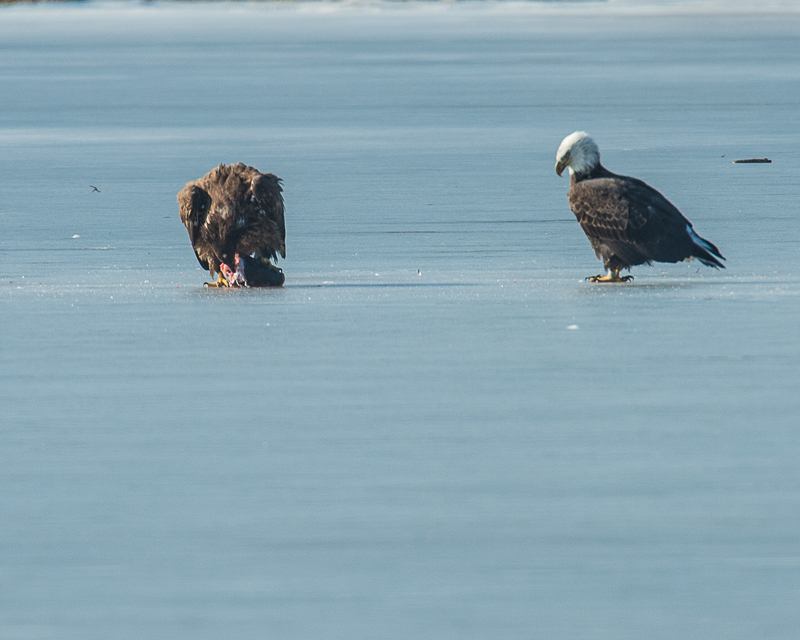 The young eagles were apparently nervous about eating their lunch. Robin at George’s Island. I can’t wait for spring, either. There were berries in the bush below this tree. 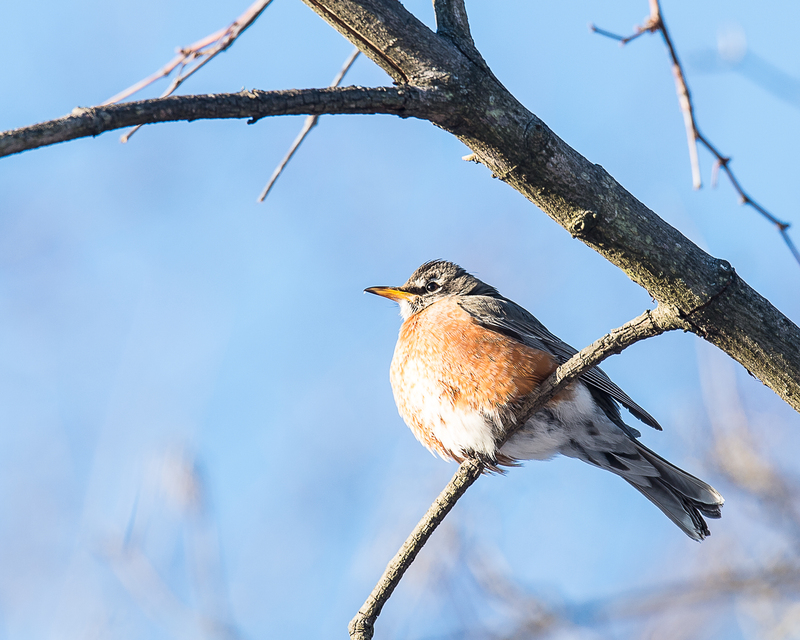 A large flock of robins was enjoying a meal. While making my eagle rounds on the Hudson River, I passed by Charlie and Karolyn who told me to get to Annsville Paddlesport Park quick. You can imagine what had happened previously. 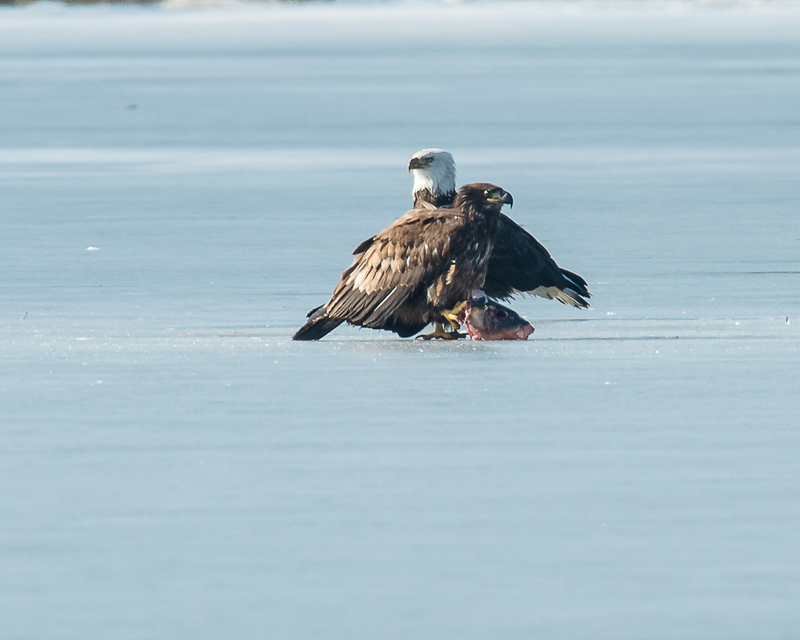 This adult beat out 6 to 8 other eagles for a few minutes anyway. 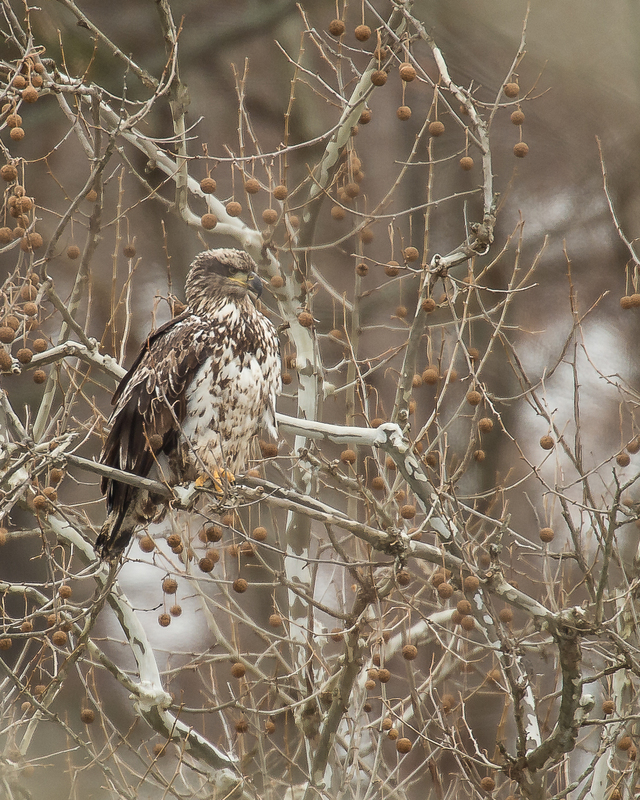 This is my bird who was at Verplanck in the white house tree the day before. 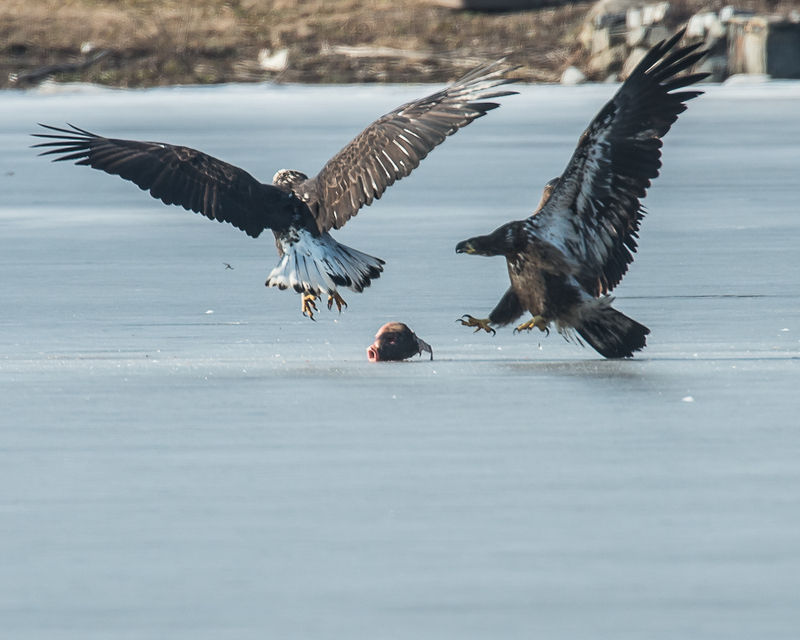 This is a first year eagle learning how to steal food. We made our fourth and final trip for the season on Monday, Nov. 26, 2012. It was supposed to be cloudy, but it was a sunny, great day. 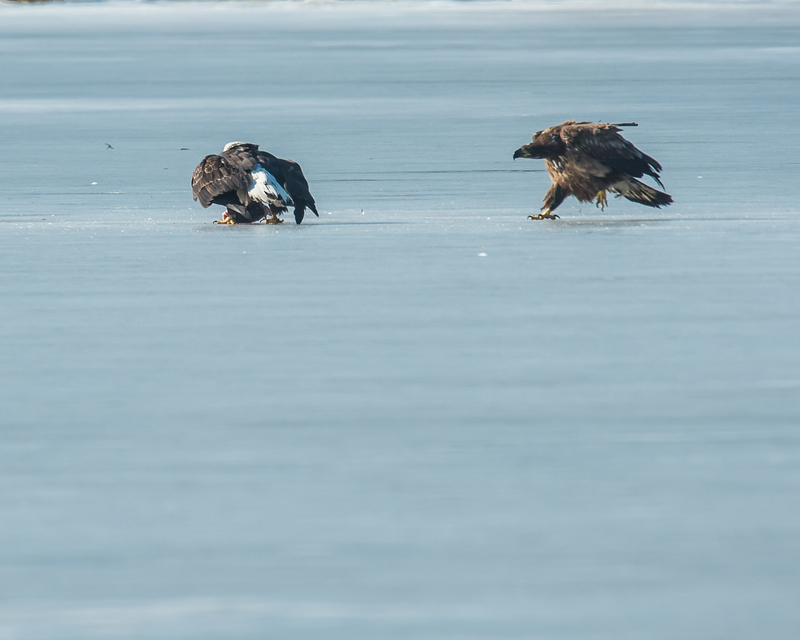 I finally managed to get a flight shot with my old 600mm and 1.4 teleconverter. The birds were right in front of me as usual. 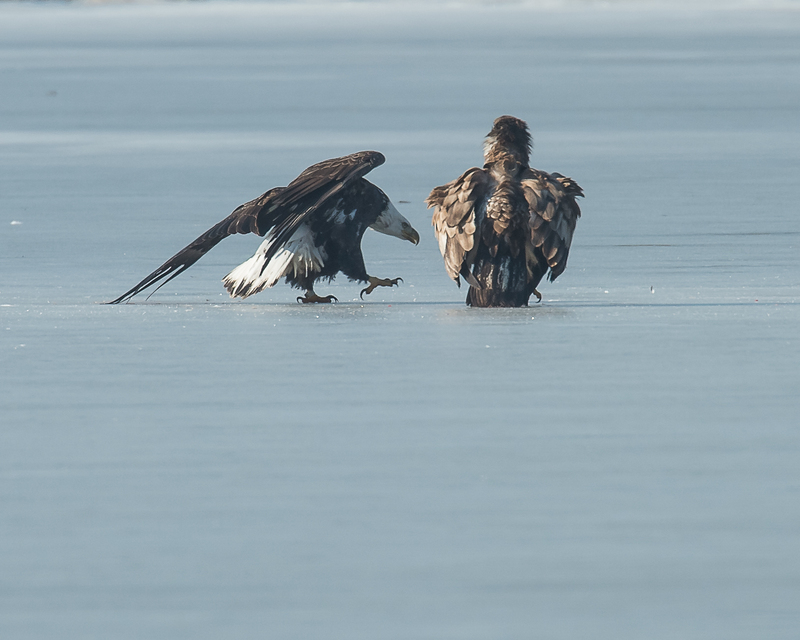 Some people want to know what equipment and settings are used to photograph the eagles. I have two cameras, a Nikon D3003 and an old Nikon D50. 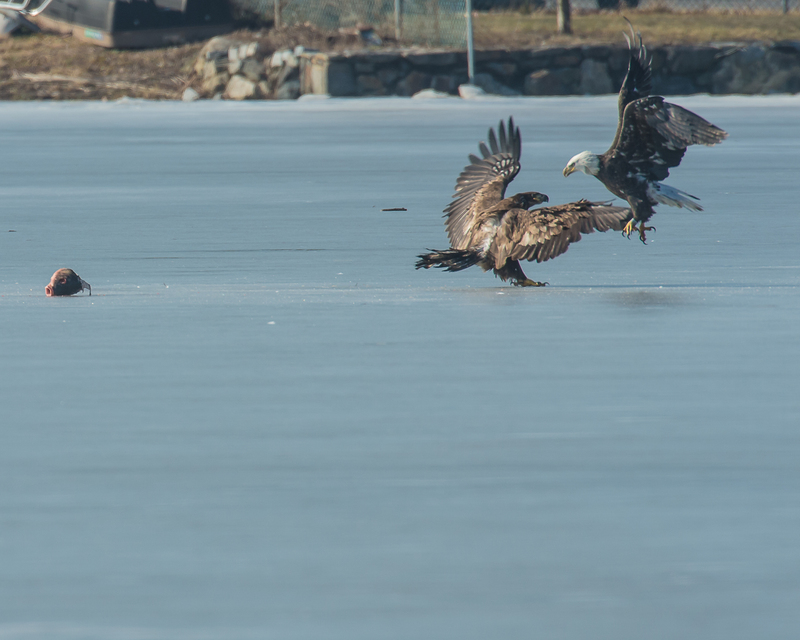 I put the D50 on the 600mm and use the D300s with 300mm, f/4, set to the fastest continuous mode for flight shots. I often just use auto because the birds are flying in and out of the shade, up, down and across the river. The sun can disappear at a moments notice. When in shutter mode, I set to 1600 or 2000. And ISO is set to no higher than 400. Sometimes it is set at 200. My cards are 90s and 95s SD and CF. I keep a 32 mb SD and 16 mb CF card in the D300s. The D50 only uses an SD without the HD and usually only 2 mb. I have to change that card once. I take between 1200 and 2200 shots during a full day. I delete most and end up with about 100 or so that are worth looking at again. Out of those 100 I am lucky to get 10 or so fairly decent pictures.